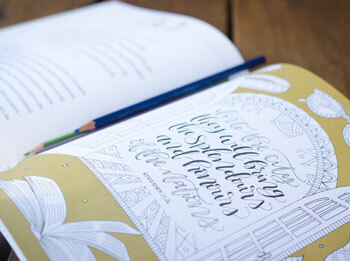 Can Coloring Books Be Done to God’s Glory? Here’s a sample. The layout is Scripture and a brief meditation I’ve written on Heaven and the New Earth on the left, and a full page of coloring on the right. One of the main reasons I agreed to do this book is that I love books, I love publishing, and I really enjoy trying my hand doing different kinds of books. You don’t know what you can do until you try. I love writing a wide variety of books. That’s why I started writing novels in the early 90’s. I’ve done theological books, devotionals, a women’s book, multiple novels of different genres, children’s books, picture books, graphic novels, and now…a coloring book. I recently read a review saying, “I think the author just wrote this book to make money.” Honestly, though I don’t think making money is wrong, it’s safe to say it doesn’t motivate me much since I don’t receive any money from the books I write. So the coloring book idea has nothing to do with making money; it has everything to do with the fun of God-honoring creativity and trying to touch the lives of different people in a different way. They are childlike, and we are to put away childish things. God created and values a childlike spirit (Mark 10:14-15). Jesus held children on His lap and said, “Truly, I say to you, unless you turn and become like children, you will never enter the kingdom of heaven” (Matthew 18:3). Certainly if “childlike” and “childish” refers to what’s immature or dishonoring to the Lord, we’re wise to avoid it. But when Paul says that he “gave up childish ways” (1 Corinthians 13:11), he was referring to immature things we should naturally outgrow. He was not referring to childlike delight in God and in life, which we, as God’s children, should never outgrow! Let’s not decide that because children color, coloring is automatically off-limits or silly for adults! Artists aren’t “childish” when they draw or paint or color. Must one be a professional to engage in such activity? Children enjoy doing many things, including eating ice cream, laughing, swimming, and playing games. Those are all things that adults can do too, allowing their delight to draw them to Jesus, the Source of all joy. They are a waste of time, and we are to redeem the time. Compare the time spent in relaxing, exercising your creativity, and reducing your stress levels with the hours we spend looking at our phones or watching television and movies, unsure of what might come up next that displeases God or disturbs our souls. Even if you still think coloring is a waste of time, it’s fitting to ask, “You wouldn’t waste your time doing coloring books, but how do you feel about your time spent on social media and talk radio and sports radio?” We can overdo anything, but all these things in moderation can be healthy. If what you otherwise would have done with that hour is pray, read the Bible, feed the poor, gather with your church, or share Jesus with your neighbor, then sure, just say “no” to the coloring book! But if you would have spent it doing a number of other discretionary things, then feel free to say “yes” to the coloring book. They are trendy, and we must never be trendy. But often trends point to felt needs, and sometimes these felt needs are legitimate. Life has become extremely stressful to many people, and they find themselves worrying. Watching the evening news, listening to radio, and talking negatively at the workplace about political trends doesn’t help (nor does viewing ten murders a night on entertainment television). The constant stream of information, pictures, and news from social media and the internet can leave our minds fragmented and our souls empty. In contrast, Jesus said, “My peace I give unto you” (John 14:27) and “Come onto me all you who are heavy laden” (Matthew 11:28). Certainly reading and mediating on God’s Word can and should be our primary source of stress-relief. But He provides countless other sources of joy and refreshment, including family, friends, food, nature, sleep, and hobbies. These are good gifts from our Father (James 1:17). Coloring books can be the same. My wife is extremely gifted musically and can play anything by ear. But she doesn’t like to play in front of people. So I got her a keyboard with a headset she can plug in. It’s pure fun and therapy for her, like biking and snorkeling are therapy for me. So why wouldn’t it be okay for people to experience meaningful creativity and stress reduction through coloring books? They can be done to God’s glory. “Whether you eat or drink or whatever you do, do all to the glory of God” (1 Corinthians 10:31). I ride my bike to God’s glory. And I worship God while joyfully playing tennis and snorkeling, just as I worship Him while enjoying music, reading God’s Word, and playing with dogs. We can worship God as we eat, drink, work, and enjoy hobbies, nature, and art. I encourage you to exercise your creativity instead of being hand fed the endless mind-numbing products of movies, television, video games, and other addictive habits. They are good in moderation, just as food is good in moderation, but gluttony is not good. God values creativity. Practicing it now can be a foretaste of the creativity that will be unleashed on the New Earth. The first person Scripture describes as “filled with the Spirit” wasn’t a prophet or priest; he was an Israelite craftsman (Exodus 31:1-6).God gifted and called Bezalel to be a skilled laborer, a master craftsman, a God-glorifying artist. The gifting and calling were from God (Exodus 35:30-35). If you don’t believe craftsmanship will be an important part of the New Earth, read Exodus 25–40. God tells His people in exquisite detail how to sew clothing, what colors to use, how to construct the furniture for the Ark of the Covenant and Tabernacle, what stones to put on the high priest’s breastplate, and so on. He instructed the Israelites to make the priests’ clothing “for glory and for beauty” (Exodus 28:2). The design, precision, and beauty of these things tell us about God, ourselves, and the culture of the New Earth. God’s instructions and His delight in the gifts He imparts to people to accomplish these tasks make clear what we should expect in Heaven: greater works of craftsmanship and construction, unhindered by sin and death. When we die, we won’t leave behind our creativity, but only what hinders our ability to honor God through what we create. Meanwhile, we can get a head start and exercise that creativity in Christ-honoring ways. It’s inexpensive, and you won’t end up wasting much money even if you don’t continue. You can’t take up golfing, scuba diving, or skiing without spending a ton of money, and in many cases these costly hobbies are given up quickly. But your worst case scenario is some unused crayons or pencils or pens you can give to friends or grandkids, and the cost of one coloring book (I checked online and they range from $4 to $14, the more expensive ones being, as you’d expect, higher quality). If you have some crayons or colored pencils, give it a try. Just get one adult coloring book (no, it does not have to be Picturing Heaven!). Try it. If you feel God increasing your joy or decreasing your stress, if you feel Him pulling you away from less creative and more unhealthy ways to spend your time, great. If you want to get more coloring books, one at a time, fine. My suggestion is this: Let’s not mock as silly and wasteful what brings harmless joy to others. I don’t collect stamps, baseball cards, coins, or rocks, though I did as a child. You may think that means I moved on from childish things. But I’ve found other diversions, and most of them, I believe, are edifying, refreshing, and God-honoring. Some people keep their childhood hobbies as adults; others move on. But it’s not always a good move, certainly not when harmless childhood interests are replaced by harmful adult addictions. Yes, unhealthy obsession and focus on things that won’t last isn’t our goal. But seen properly, even small things like coloring books can draw our heart to worship Christ. 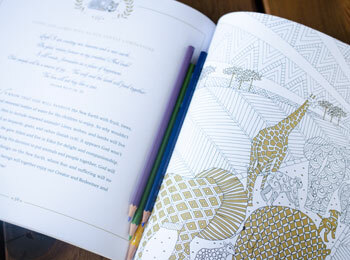 …can Bible-themed coloring books actually aid spiritual discipline? I think they can, but like any tool, it depends how we use them. …For those who do like the Scripture-based coloring books, the length of time it takes to color in a verse is long enough for meditation and even memorization of the verse itself. …I may not be convinced by the arguments that coloring “unleashes creativity” or lowers the activity of my amygdala—in fact, I still feel a little silly every time I pick up the coloring book on my coffee table—but I am starting to crave my coloring time. It’s a flexible tool that helps me maintain a healthy mind and a healthy heart. Read the rest of her article. Is It Blasphemous for Us to Study, Discuss, and Try to Envision Heaven? A while back, someone on Facebook commented that my book Picturing Heaven is blasphemous because it attempts to picture God’s dwelling place. I respectfully disagree. If we enjoy hearing our children and grandchildren pray, how much more does God love to hear the prayers of His children.